The control and restraint necessary to avoid war, relied on direct communication between the largest countries in each camp; the United States of America and the Union of Soviet Socialist Republics. Management of lesser conflicts is through the Security Council of the United Nations, consisting of the five victors of World War II as permanent members with veto power, and ten seats that rotate between the other countries of the UN. The two smaller permanent members, France and the United Kingdom, maintain a nuclear warfare capability which is widely seen as a blocking move against a reduction or fairer distribution of permanent seats. The current world economic situation and population sizes give stronger claims to the European and African Unions, India, Brazil, and Indonesia. As devastating a weapon as the hydrogen bomb is, the multiple warheads of an inter-continental ballistic (ICBM) missile are vulnerable before they split up. This means that missiles either need to be spread out geographically or be mobile in the case of land-based launchers. Air and sea launch systems need to be mobile and hard to detect, since they travel to their launch locations before deploying their weapons. The sea launch vehicle of choice is the submarine, since ships are too easily spotted by radar and satellite. This narrows the current ICBM delivery systems to three types; large numbers of geographically spread land silos, stealth bombers, and submarines. The latter needs to be powered by a nuclear fusion reactor to be able to stay submerged. Diesel electric submarines need to go to periscope depth to get sufficient air for their engines to charge the batteries This snorkelling operation makes them vulnerable to detection. After a disastrous foray into land-based missiles in the form of the Blue Streak project, the UK settled on a submarine based nuclear deterrent force in the 1960’s. This used UK built submarines with missile systems from the USA carrying nuclear material produced in the UK. Like the French ‘Force de frappe’ (strike force) later ‘Force de dissuasion’ (deterrent) nuclear forces, their total destructive power was insignificant compared to the total explosive yield of the arsenals of the USA and Russia. This remains true even after these powers signed the strategic arms reduction treaty late in the last century. As mentioned, the main reason for the French and British to cling on to their nuclear submarines, is to shore up their claims on a permanent seat on the UN Security Council. Much as the Dreadnought and the aircraft carrier before it, the ICBM-armed nuclear submarine is the VIP ticket that is believed to give entry to the top table. Even if the French and UK missile submarines cannot hope to execute more than a token strike against the strategic forces of any of the major nuclear powers. Their armed forces carry the halo of a nuclear strike capability. Besides the problems of being out-gunned and not having any credible targets left after the cold war, there is a much more serious problem with the UK nuclear deterrent. Advances in maritime detection systems have fatally undermined the concept of the missile submarine as a stealthy strategic platform. Underwater acoustics is a non-trivial science, but it boils down to two features. The first is the thermocline layer where changes in temperature, salinity and density have the effect of dividing the ocean into a shallow top layer and a deep lower layer. Sound waves don’t easily travel through the barrier between them. The second feature is the curved path that sound waves follow in salt water. Differences in the speed of sound cause the waves not to travel outward in a straight line, but rather curve in various directions. Most wave paths converge again some distance from the transmitter. Seen from above a convergence zone forms a circle around the sonar installation. From the convergence zone, the soundwaves diverge again and re-converge in the next zone, and the next, as very large concentric circles. The detection probability in a convergence zone is much higher than outside it. At the time the first nuclear submarines were built, this was a largely theoretical discussion. 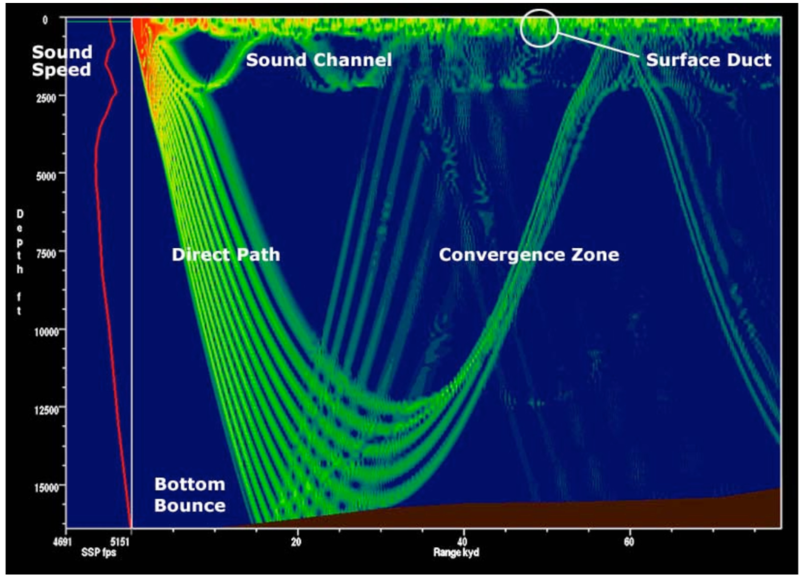 Ship sonar was firmly above the layer and sensor and signal processing technology made echoes from convergence zones a rarely observed phenomenon. This has since turned from a fluke event to a regular occurrence with the development of tactical towed-array sonar (TACTAS). Instead of being carried on the ship with all its sources of noise, the hydrophone sonar sensors are built into a long tube which is towed behind the ship. This position away from the ship, combined with major increases in computer power and pattern-recognition software has caused regular detection of submarines in the third convergence zone as long as thirty years ago. Modern TACTAS systems are not only towed by the ship, but also by small drone vessels to extend the range of a single anti-submarine warfare (ASW) unit to the order of magnitude of one hundred nautical miles. Susceptibility to TACTAS detection at a long range is a vulnerability of all submarines, but more so of nuclear powered ones. The difference in noise levels compared to a diesel-electric boat is basically comparing a steam locomotive to an electric car. In view of these developments, the conclusion is inescapable. The Trident nuclear weapon system represents a strategy that is inhumane, anachronistic, and above all ineffective. Its sole use is a cynical attempt to cling on to Britain’s faded glory and postpone the inevitable readjustment on the geopolitical stage for just a few more years. Opposing trident on the basis that it isn’t a good way of blowing people up is not a strong basis. The problem is precisely that these systems are too effective. Pogliaghi is quite correct. The only fusion reactors in existence are those at the centres of stars. This is quite a surprising error on the part of the author. If you want a virtually undetectable submarine then you should pay more attention to the current ‘S’- class U-Boat of the German Navy, non-magnetic alloy hull, an under-water range that allows it to cross Atlantic under-water and undetected without ‘Snorkels’, and super quiet ‘creeper-motors’ originally developed for U-Boats towards end of WWII, only four ever made it into service and one managed to penetrate the screen surrounding the cruiser Hampshire off Bergen in 1945, the U-Boat had just received orders to end hostilities. Oh, and an S-Class boat costs a fraction of a nuke!!!! Its worth noting that the Chinese Navy are investing heavily in further developing the technologies that Bart is referring to, its commonly referred to as the Underwater Great Wall and the worlds only naval hegemon, the United States Navy, see it as a significant challenge. The Late John Ainslie of Scottish CND produced an excellent report “Trident Nowhere to Go” in which John explained that the geography of the UK’s coastline precluded the creation of a “new” Faslane. This article by Bart J Smit, and the technological developments it signposts suggests that not only has Trident no where to go, Trident has nowhere to hide. Interesting article. But the writer is wrong to state that RN nuclear submarines use nuclear fusion. They don’t. They use nuclear FISSION which is a very different and far more dangerous thing than fusion. Fusion remains in a state of research with projects like the Joint European TAURUS Project. Of course the secrecy surrounding such a system that surpasses almost all fictional depictions of evil than I can think of means that incompetence, design flaws, accidents, known dangers and hostile abuses will like be covered up long after the event, unless a city somewhere disappears into a radioactive puddle along with its inhabitants and ecosystems. At which point I imagine the price will go up.